Dana Corporation's Spicer® Off-Highway Products Division is in Statesville, North Carolina, not Missouri, but the engineering and maintenance crew's attitude when they first heard about OpenCNC® software was "show me." A software CNC with no motion control cards or proprietary hardware? "I didn't believe it," said Kevin Smith, Dana Clark-Hurth process engineering manager. "Not for a second." Less than a year later, the Statesville crew has moved from trying OpenCNC software on one aging Warner & Swasey 2SC to a plant-wide commitment to upgrade numerous machines to OpenCNC. And the word is spreading to other Dana plants. OpenCNC is the only production-proven, unbundled, open-architecture, shrink-wrapped software CNC on the market. Unlike traditional CNCs, OpenCNC uses no proprietary hardware or motion control cards. Because it's unbundled software that runs on off-the-shelf PCs, manufacturers are not locked into proprietary arrangements for hardware, control repair, or control upgrades. The Dana Statesville plant produces axles, brakes, and transmissions for off-highway vehicles. To make over 2,500 different kinds of parts each year, the plant uses a fleet of machine tools, including over 100 CNCs. The twenty-year old Warner & Swasey 2SC in the steel machining section could still make good parts, but like many aging machine tools, its obsolete proprietary control was difficult to use and impossible to repair. New operators, while learning to use the ancient control, would bump the turret into the part, knocking it out of line. Then, they'd forget to put the machine into manual mode before opening the door, which caused more problems. The result was frequent downtimes, bad parts, or no parts at all. The maintenance crew got tired of resetting the turret, and everyone finally agreed to just haul the machine away. "The obsolete control was killing the productivity of the machine," explained Thomas N. Payne, CNC electronics technician. "And it did not allow for any low-cost solutions." At the last minute, MDSI's OpenCNC appeared, offering Dana a new solution to an age-old problem: a low-cost way to replace machine's obsolete control and extend a machine's productive life. From the beginning, the retrofit with OpenCNC was easier than anyone expected. About half the machine's control panel was removed, but machine was mechanically sound. The open system approach of OpenCNC did not obligate Dana to replace the drives and motors as part of the control replacement. And it allowed the Dana engineers to purchase their own off-the-shelf computer hardware. "We just hooked up the spindle drive as is," Payne explained, "installed OpenCNC on a regular Dell® computer, and started it up." With OpenCNC, the Warner & Swasey increased its travel speed 50% percent, from 200 inches per minute to 300 inches per minute, with existing servo drives and motors. OpenCNC simply allowed the machine to use its servos more efficiently. "Not only were we using the original drives," Payne noted, "but we weren't taxing them. We had absolutely no faults in pushing this old machine harder. And we didn't have to do a drive alignment, only minor tweaking." They also gained backlash and leadscrew compensation. "When you strip out an old control for a rebuild or a retrofit," Kevin Smith said, "you're taking a large leap of faith. We sent our maintenance people to MDSI for some training. MDSI's procedures were well documented, and it was all very straightforward and easy to do." No more tape readers - The original control on the Warner & Swasey used a tape reader to read part programs, which meant that every time a new program was needed, someone had to punch new tape, carry tape to the machine, read the tape in and then prove out the part program. "These were time-consuming, non-productive tasks," Payne said. "Today we transfer part programs directly from engineer's desktop PC to the machine tool PC, via the company network. 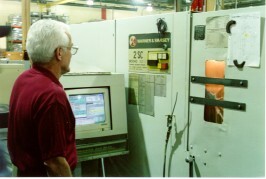 For this Warner & Swasey, we've developed over 100 new part programs since we switched to OpenCNC. The time savings on loading the part programs alone makes the whole thing worthwhile." This was achieved through OpenCNC's integrated DNC capability. Maintenance work orders dropped 90% - "I didn't realize that changing the control would make such a difference in the number of maintenance work orders," Payne said, "but it did. I had a stack of 36 maintenance work orders on the identical machine next to our OpenCNC machine. For the OpenCNC one, we only had three-and none of them were related to the software." Easy to use, even for non-machinists - "We've had five or six different operators come through on this control," Payne said, "some of who have never been machinists before. No one has bumped a turret out of line in a year." Operators like it - Operators with 30 years of experience as well as new operators who have never run production before have tried OpenCNC and had the same reaction. "They're so pleased that they have all these options," Payne said, "they're pushing to have everything in their area on OpenCNC. And once we do, we can move operators from machine to machine, without additional training." Each Dana plant operates independently, but the word about OpenCNC is spreading. At a nearby Dana plant in Morganton, North Carolina, manufacturing manager Sammy Nguyen wanted to retrofit a J&L two-axis lathe. Mechanically the 20-year old machine was in good shape, but its original control was obsolete and unreliable. Nguyen rejected several other controls choices because they were too expensive and not user-friendly. He heard about OpenCNC and went to Statesville to observe the new control in action. "Lots of people in Statesville recommended it," Nguyen said, "but I wanted to see for myself. I focused on the control and the output of the machine itself. I observed a good quality output and did not see any negatives at all." After retrofitting the J&L lathe with OpenCNC, Nguyen reports better-than-standard machine capability, according to QS9000 testing, and several other advantages. "Uploading and downloading programs is easier with OpenCNC," Nguyen said, "and the software is easy to edit. I can go in and upgrade when I want to, and I can change what I need to." OpenCNC was recently installed on two machines in a Dana plant in Cleveland, and each machine was successfully cutting parts within four days. OpenCNC is also running a machine in a Dana plant in Mexico. Because of its open-architecture, all-software design, OpenCNC opens up broad possibilities for collecting machine data, performing machine diagnostics, and monitoring machine performance. Virtually unlimited data can be collected in real time-the choice is up to each manufacturer. "With OpenCNC, we can literally look into the software," Smith said, "and see what the spindles are doing, how fast it's turning, how many times a door has opened, or what the encoders are doing. There's all kinds of things we can tap into." Since the original installation, OpenCNC has been installed on additional machine tools at the Statesville facility. In addition, the OpenCNC software was upgraded to a new version on the original Warner & Swasey, and Tom Payne reports that the upgrade went exactly according to plan. "Flawless," he said. "We got new features, no problems, and it only took about an hour. With an old-fashioned, proprietary control, we would have had to buy an entire new control and hardware to get that." Once additional machine tools are retrofitted with OpenCNC on Microsoft® Windows NT®, those machine tools can be networked, and the way is clear for true open architecture, agile manufacturing. OpenCNC on Windows NT allows operators to develop their own software programs, so that they can add functionality and link CNC machine tools in real time, from plant to plant. "Our original OpenCNC machine has now become one of our most efficient machines," Kevin Smith concluded. "What OpenCNC has done is put control into our own hands, so we can control our own destiny. We can do whatever we want with the software. We really have found no limits to it at this point."